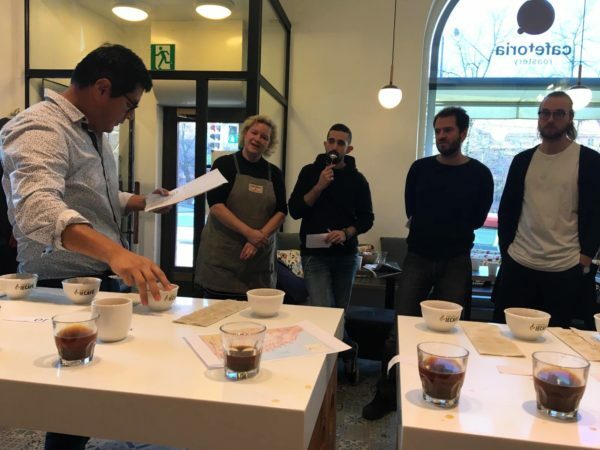 Last Sunday 18.11 we arranged a cupping session to taste the best coffees of Peru, the winners of the Cup of Excellence – Peru chapter. Some coffee colleagues, B2B customers, friends, the Consul of the Embassy of Peru and the 2 lucky winners of our lottery joined this event. It was a fun event but also an eye-opening one because the flavours of Peruvian coffees greatly surprised to all of us. Traditionally, Peruvian coffee is known by its chocolate and sweet notes, medium body and high acidity. However, many of these coffees were very complex with sensory notes similar than those found on Kenyan or Ethiopian coffees. We were able to identify in many lots flavour notes such as grapefruit, cherry, camomile, peach, nuts among others. Definitively the quality of the Peruvian coffees have improved a lot during the last 15 years. To have some conclusions we asked each participant to choose their 3 most favourite coffees and their 2 lowest favourite coffees. After tasting the coffees we revealed the origin of them and the results were actually quite interesting, although not surprising. The favourite coffees in the session was the #4, followed by #2 and #5. The most surprising result was that our Gran Palomar was the 5th most favourite coffee! Incredible isn’t it? My opinion is that Gran Palomar offers more approachable flavour notes such as nuts, honey and chocolate. This is perhaps the reason why some people chose it. Participants that were more involved in the coffee sector did not choose our coffee but decided to go for more complex coffees. In my case for example, I chose, as my favourite ones, the #3, #4 and #10 because of the complex berry notes of those coffees. As for the “less favourite” coffees, you could think that most of the people would choose coffee #22 and Gran Palomar, right? Interestingly not! The less favourite coffee was coffee #7 (La Naranja) and the second less favourite coffee was our Gran Palomar! Personally I think that the quality of the coffees from those winning farms are outstanding and the ranking is just there for the auction. Yet, it is good for quality purpose to quantify quality but let’s not forget that organoleptic factors are not absolute and each of us has our own winner coffee! By the way, the auctions of the Peru Cup of Excellence was yesterday. My beloved Coffee #3, El Romerillo was purchased by an Australian company. The lucky ones were able to offer 18,000 USD for this coffee (40 USD/kg). During today and the following days you can come to our Café in Töölö and ask for a cup of coffee prepared with one of these winning lots. My recommendation: ask a cup of coffee from El Romerillo (#3) or Candelaria (#4). About El Romerillo, I love those clear notes of grapefruits, red currant, peach, cherry and Aguage (a tropical fruit similar to lychee).